Memories of When We Were Birds by poet Ray Sharp takes readers on a walk through the rugged landscape of Michigan’s Keweenaw Peninsula. Sharp’s unique voice, tempered by the region’s stark beauty and harsh climate, echoes with the cries of coyotes and crows and soars on the wings of majestic Sandhill cranes. Memories is an unforgettable journey through the four seasons that explores the wild and untamed territories of the human heart. 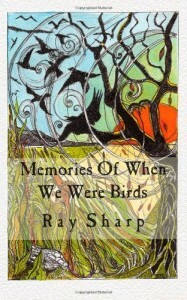 Ray Sharp writes poetry and fiction from his home near Lake Superior on Michigan’s rugged Keweenaw Peninsula. His poems and stories have appeared in numerous on-line and print journals and anthologies, including Astropoetica, The Blue Hour, Bolts of Silk, Camel Saloon, Caper, Contemporary American Voices, Cowboy Poetry Press, and many others.